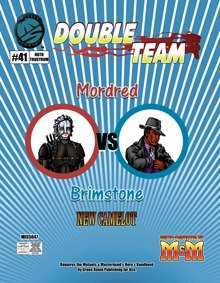 Double Team: Mordred VS Brimstone provides two characters for your Super-Powered by M&M games: a villain, Mordred, and a hero, the half-demon, Brimstone. Mordred is a part of our New Camelot mini-series. Mordred is King Arthur's son and murderer from the days of ancient Camelot, now reborn in the body of a violent vigilante with power over light and darkness. As he did in his previous incarnation, Mordred seeks to usurp his sire's position, power, and respect, and claim what he considers to be his rightful place on the throne of all Britain. Brimstone was sired by a demonic father during a cult ritual. After reaching maturity and coming to terms with his existence, Brimstone now acts as a private investigator, helping people fight back against dark magic and similar supernatural evils. Also included are three revised or appended advantages, and two new advantages. The advantages contained within will also appear in Better Mousetrap 3e upon its release. Okay, this one seems like it'd be something I'd really be interested in. Once I get it downloaded, and read through it, mind if I post a short review?